The hunt of the Satay Saga begins from the Big Bad Wolf Sale. After going for the sale, I was feeling hungry but it was too early for dinner leh. Baru 4pm plus going to 5pm. How ah? So Papa drove around lo. 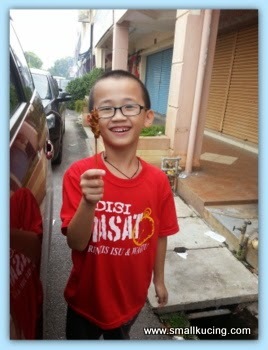 Mamarazzi said let's go eat satay la.He asked what type? Satay celup or pork satay? Mamarazzi thought...huh....got pork satay? Okie....so Papa drove to Sun May Hiong Pork Satay Restaurant. As we neared the restaurant, the girl who was making the satay waved her hands said no more. But since we were there, I wanna go toilet Mamarazzi asked me to go and ask . I asked the girl and she said "Mei yoh liao"(no more). Must be due to my cute sad face, the girl offered me one stick of satay on the house. . Hehehe....what a wonderful gesture. 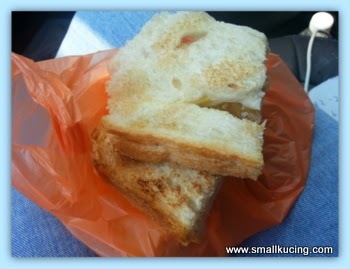 Yum.,...sedap. I offered Mamarazzi a bite. Nice. The next day after we check out from the hotel, Mamarazzi thought why not go and "tapau" some satay from there as it's not that far from our hotel . Arrived there not open . Google...some says Mon-Sun opens fro m 10am...some says Thursday to Sunday...Don't know la. Any readers from Melaka? Can advise us on the business hours of this restaurant? Not many people there yet. The staffs were busy preparing the satay. Bought 20 sticks. 80sens a stick. This is the Pork satay from Xiang Ji. Papa and Mamarazzi finds it a bit too well marinated and the gravy not thick enough. But for me, I like it well enough leh. Said salty but finished also in a blink of an eye. 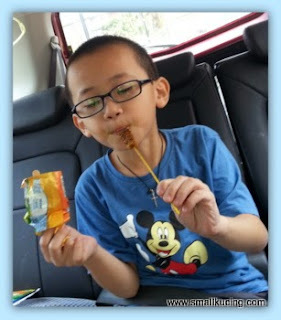 Papa asked wanna try others Satay or not? Google again. 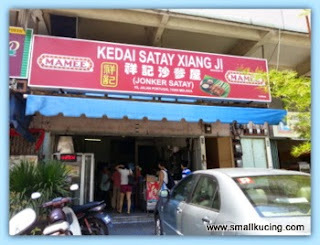 Found good review about satay from Lung Ann. This time Papa got down and bought. 15 sticks pork satay, 5 sticks of liver satay and 5 sticks of intestine satay. Each stick cost 70 sens. Mamarazzi ate the intestine and the liver satay...hey! not enough to share la....Papa asked want some more or not? Off we went one more round...This time Mamarazzi bough 10 sticks of intestine satay and 10 liver satay. 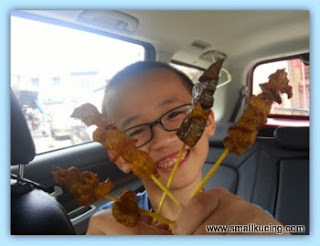 But by the time she got back into the car..Papa finished off all the 15 sticks of pork satay! Alright alright....I "help" a stick or two la. One more round.....went again...this time bought 20 sticks of pork satay. Also got the lady's phone number. She was real friendly. If not mistaken, they rest on Thursday. 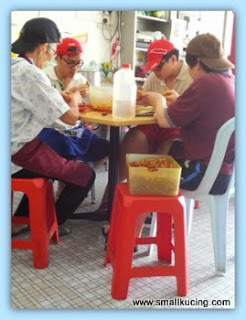 She said best call first coz sometimes they are not open too if they could not get the fresh ingredients for the satay. While waiting for the satay, Papa also "Tapau" kopi-o Ice and the Roti Bakar. Fuiyoh...the kopi-o cukup kau. Nice. Sure can stay awake till arrive KL. Love the Roti(bread) too. wah, pusing so many rounds for satay until I am also not sure which round buy from which shop. But good lah Paparazzi was willing to round and round until everyone gets to eat their fill of satay! What a hunt, but finally successful! We do not have this here. We have something similar called Kebabs. they are meat or vegetables cooked on a stick with dipping sauces. 1 stick of liver satay, please ... I pay you $1 ... smiles ... Love, cat. Wah! Pork satay! I want!!! I would like to try the pork Satay. I have never tried it before. fuyoh, Uncle SK also lost count how many cucuk you all had already, haha!! it's like eating non-stop hor?? 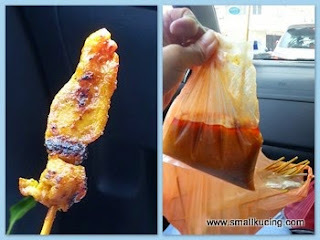 these satay was for breakfast ke, or morning tea snack?? hehe.. but okay lah because satay little bit only lah..
You tapao-ed so many satays to eat in the car?? Your car must smell lovely! I love satay but the gravy should be thick and tasty. Any meat satay but not the intestine and liver ones. 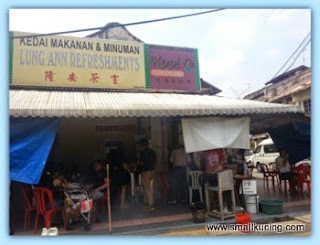 After trying all the different satay, which is the best one that you would recommend? My hubby would love the liver satay! Wow...you all ate 85 sticks of satay? That's a lot! My maths....how...dapat 'A' ke? So you had a lovely satay day!! hee..hee...satay babi! I have the recipe but very lazy to make. 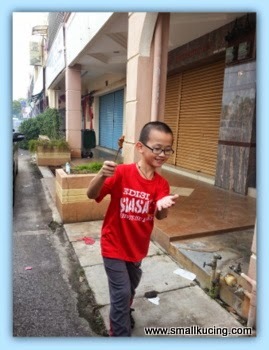 wah .... satay hunting! I like! SO GENG!! Went round three different shops for satay... hahahaa... Chun Hoe Yeh!! I love this type of food adventure! glad you found what you were looking for, even if you had to try a couple of places. Pork satay is tempting. One of my fav. Wahh that's a LOTTTT of satay! 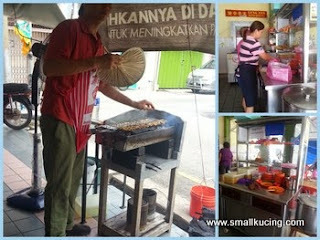 Honestly, I cannot remember eating any pork satay in KL. I always had them in Thailand which is quite popular there compared to chicken or beef! hard to find pork satay in KL la.